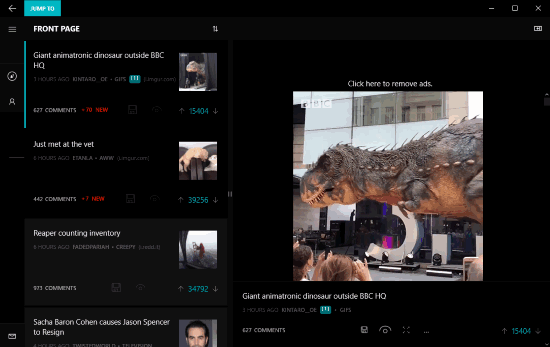 Here are 4 free Reddit apps for Windows 10. You can sign in with your Reddit credentials and then access your Reddit profile to read messages, add a new post, sort posts, upvote, downvote posts, add comments, browser comments, share a post, etc. You can even use these apps without any sign in. You will be able to browse subreddits, search Reddit, view any post (be it image or video), save an image, etc. These Windows 10 Reddit apps come with some unique features as well. For example, you can connect multiple Reddit clients, use dark and light themes, pin subreddits, etc. There will be ad(s) on the interface of these apps in their free plans, but still, all these Reddit apps for Windows 10 are pretty good to have a good Reddit experience. Let’s check these free Reddit apps for Windows 10. Reddit ReddHubV2 (Homepage) is the new and improved version of “Reddit on ReddHub“. You can use earlier version as well but this one is really cool. 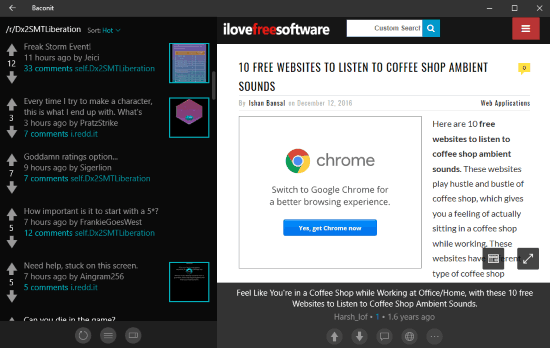 Its interface supports light and dark themes where browsing Reddit is more fun and comfortable. Apart from that, you can add multiple Reddit accounts and then use any of them. This is one of the biggest advantages of this Windows 10 Reddit app over other apps. While some other apps let you connect only one Reddit account, this app helps you connect multiple Reddit accounts. Once the account is connected, you can check messages, create a new post, check account age, link karma, etc. There is a lot to do other than accessing your account. You can download an image, upvote and downvote a post, subscribe/unsubscribe to a particular subreddit, pin a subreddit, search for some item, share some post, etc. The interface is also user-friendly. The left section contains all the options related to accessing a particular subreddit, your account, or other content, and the rest of the part shows the post selected by you. Thus, you can easily read or view a Reddit post and enjoy Reddit directly from the desktop. Readit (Homepage) is a very good competitor to “Reddit ReddHubV2” and other Windows 10 Reddit apps available on this list. This Reddit Windows 10 app also lets you add multiple Reddit accounts on its interface and use them. The left section helps to login with your Reddit account, browse subreddits, refresh posts, explore subreddits alphabetically, explore subreddit of the day and trending subreddits. You can also view your Reddit profile and access messages, comments, upvotes, saved posts, hidden posts, etc. When you click on a post, it is visible on the right part of its interface. By default, the interface theme is set to dark mode but you can switch to light mode or legacy dark mode also. Apart from that, you can adjust other settings also. For example, you can enable toast notifications for new items, mark a notification as read when you open the inbox, set a particular subreddit for front page (means when you will open its interface, that particular subreddit is opened), etc. The interface and options are pretty good. This is really a handy Windows 10 Reddit app. Its full review is present here. The best part that I like about this Reddit app for Windows 10 is its interface is similar to Reddit web app. Here is the homepage of Redditting for Reddit app. Another good thing is you can add multiple Reddit accounts by accessing Settings. The interface of this app is neatly divided in three sections. The left most section helps to access menu, Inbox of the selected Reddit account, search Reddit or find a subreddit, create a new post, etc. You can also collapse this section to have more space while using this app. The second section next to left most section is there to view the list of posts based on the selected subreddit. You can also sort posts by rising, hot, new, top, controversial, etc. And the right section shows the selected post. You can view image, video, animated GIF, etc. The options to browse comments, move to the next post, upvote, downvote a post, etc., are also present. Overall, this Reddit app for Windows 10 is better than many other Reddit apps and therefore a very good option to try. 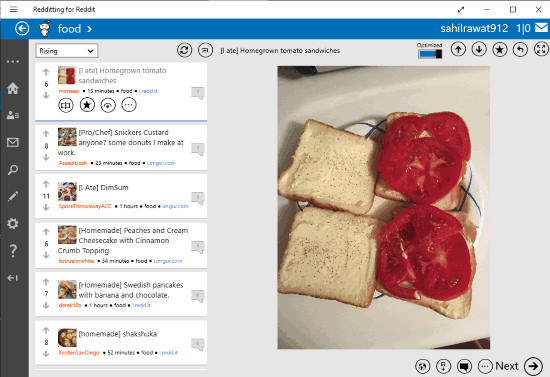 Baconit is also a fantastic Reddit app for Windows 10. It lets you connect only one Reddit account but the features are pretty good. While reading a post, it lets you sort comments by best, controversial, new, old, etc., and set maximum count for comments (50, 200, 150, or 300). Posting a comment, new post, saving an image, finding a particular subreddit, sorting a subreddit by hot, new, rising, top, or controversial, and other features are available to use. You can also check trending subreddits which is a rare and interesting feature of this Windows 10 Reddit app. Its interface comes with dark theme mode. I wish it would had come with light mode also but only dark theme is present. Still, the interface looks very good and exploring subreddits and posts is convenient. You can also adjust some settings like enable/disable NSFW mode, preload comments, future post content, automatically minimize story header in comments, etc. You may also check its separate review. These are my best picked free Reddit apps for Windows 10. All are very good apps because you can connect with your Reddit account and enjoy exploring subreddits, posts, and much more. You should try all these apps and then decide which one is best for you. My favorite Windows 10 Reddit app on this list is “Reddit ReddHubV2”.